In the summer of 1900 Puccini watched in London the representation of the drama Madama Butterfly that David Belasco had adapted from a novel by John Luther Long. The drama was in English, for this reason Puccini did not understand a word. However, he left the theater deeply shaken by the tragic story of the young Japanese geisha killing herself "with honor", after waiting in vain for the return of Pinkerton, an American Navy lieutenant who married her for fun and gave her a son. After that Puccini decided to transform Madama Butterfly according to Puccini's style: starting from the Japanese pentatonic scales to the anthem of the American navy, from the harmonies of a distant and archaic world to the references to the "Tristan". Despite the moving result, the Milanese premiere (Teatro alla Scala, 17 February 1904) was a fiasco; one of the most memorable fiascos in the history of the opera together with the one of Verdi's Traviata. 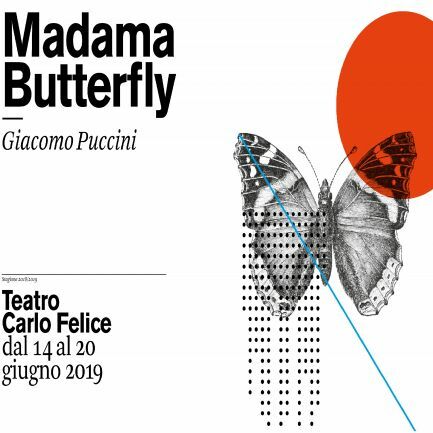 But Giovanni Pascoli was right when, in a postcard sent to Puccini after the disastrous recital of La Scala, he predicted: «the butterfly will fly».